Home Blog Apple Mac Apple Finance on New Macs – Is it a Good Deal? Apple Finance on New Macs – Is it a Good Deal? Apple have recently started offering 0% finance on their products via PayPal Credit , but are they really offering a good deal? Apple offer an iMac at £2019.00 on 12 months interest free credit, with a £0.00 deposit, which looks attractive at first glance, but there is no warranty with that and the repayments are £181.26 per month – don’t forget you have to pay the full amount back within the 12 month period, otherwise you’re hit with the interest at 14.9% APR. 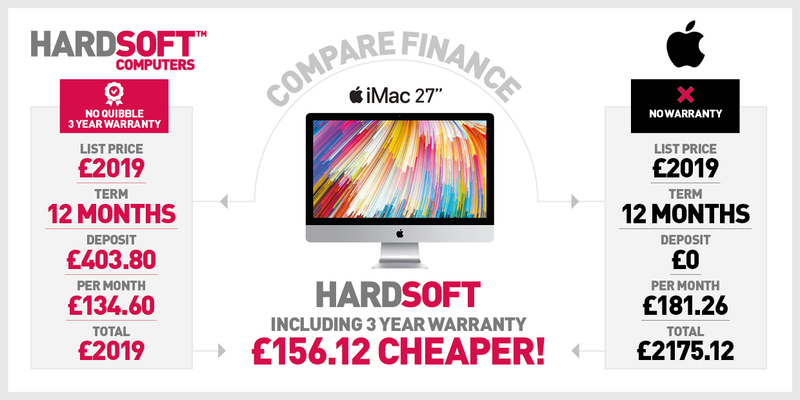 Alternatively, if you take a look at the HardSoft lease on the same iMac at £2019.00 over a 12 month period, the difference is we ask you for a deposit of £403.80, but with repayments of £134.60 you’re left with almost £50.00 more in hand each month. Combine that with the 3 year HardSoft warranty and you’re quids in! As authorised Apple Resellers, you can be confident that we are Apple specialists, we offer a full range of products for lease over a 1 to 3 year period. Apple have recently updated the specs across their range, such as the new 2017 iPad Pro 10.5-inch, featuring the same A10X Fusion chip as the 12.9″ iPad Pro. This new smaller model weighs only 450 grams making it incredibly portable and a great option for anyone who is always on the move. The Macbook Pro 13-inch update includes the Intel Kaby Lake Chipset with 7th generation Dual Core CPU’s with options to upgrade to the Dual Core i7 CPU. It’s thinner and lighter than its predecessor and still boasts up to 10 hours battery life, or if you prefer a larger display why not go for the top of the range MacBook Pro 15-inch. It’s the ideal notebook for professionals looking for fast performance in a super compact and light design. Featuring a stunning 15″ Retina Display that is 67% brighter than before, 7th generation Quad core Intel Core i7 2.8GHz or i7 2.9GHz Processors and advanced Intel Iris Pro and AMD Radeon Pro 555 Graphics (2.8GHz Model Only) as well as updated PCI Express-based flash storage available in 256GB up to 2TB making it 100% faster than previous flash storage. As you can see, there is lots to be excited about from the new updated range. To view the full range of 2017 Apple products available to lease from HardSoft, take a look at our website: Notebooks, Desktops, iMac Networks, iPads, and iPhones. If you’d like to find out more about interest free financing for home users HardSoft, give our Sales Team a call on 020 7111 1643 and they will be happy to talk you through all the options available.